A brazen attack carried out by a Somali militant group at the Westgate Mall in the Kenyan capital of Nairobi has killed at least 68 people, the national Red Cross said on Sunday. The death toll was revised from an earlier number of 39 dead and 150 injured announced by Kenyan president Uhuru Kenyatta in a televised speech. “With the entire nation, I stand with the families of those who have lost their lives and extend every Kenyan’s deepest condolences,” Kenyatta said. Two Indians, including an 8-year-old boy were killed in the attack while four others, including two women and a girl, were injured in the attack and are receiving medical treatment, the spokesperson of the Indian Ministry of External Affairs said. 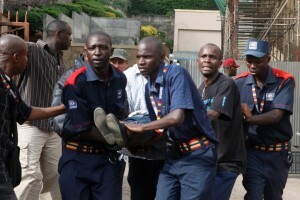 Late on Sunday, Kenyan forces launched a “major” offensive, police officials said, to end the two-day standoff. “HSM has on numerous occasions warned the Kenyan government that failure to remove its forces from Somalia would have severe consequences.” “The Kenyan government, however, turned a deaf ear to our repeated warnings and continued to massacre innocent Muslims in Somalia,” the group said. Meanwhile, the Kenyan President said security has been enhanced across the East Africa nation, with numerous measures put in place to hunt down perpetrators of the heinous act. “We shall hunt down the perpetrators wherever they run to. We shall get them. We shall punish them for this heinous crime,” he said. The Chinese Embassy in Kenya’s capital Nairobi said that the preliminary findings showed that there are no Chinese casualties so far in the attack. The UN Secretary-General Ban Ki-moon said he “is following closely and with alarm” the developments in Nairobi.